A proposed new lease agreement that would see one tenant’s price increase 44 percent drew a large crowd to Falcon Field in Peachtree City for the Airport Authority’s meeting Thursday night. Tommy Turner addressed the crowd and asked for a better solution than the one that is being offered. “The new lease terms and other fees will raise our rent by 44 percent and reduce the length of the lease to five years. My first thought upon receiving this huge increase was that the airport must really be in a financial bind. A review of the airport finances shows a cash position in excess of $1.5 million and 2018 receipts on track this year to produce $400,000 in excess of expenses,” he said. Turner said his current lease is for 20 years, and he would prefer to see it stay at 20 years. “These hangars are major investments for many of the owners and a five year lease greatly devalues the hangars. When trying to sell a hangar, a new buyer would have a problem financing a hangar with only a five year lease. A five year lease discourages improvements and proper upkeep of the properties. At the last authority meeting, two new hangar builders were given 30 year leases,” he said in a statement provided to The Citizen prior to the meeting. Turner also added the rate would be nearly twice what is charged at Coweta’s airport, based on a square foot calculation. He said there would also be an additional fee of 10 percent charged. “The new lease requires that in addition to the ground lease payment lessees shall also pay the airport 10 percent of all revenue taken in on the property. If I rent hangar space to other aircraft, I must charge at least 75 percent of what the airport charges in their large hangar. This is to be paid monthly and it is my responsibility to find out each month what the airport is charging their renters,” he wrote in his statement. Turner suggested freezing the lease proposals until issues could be worked out with the tenant. 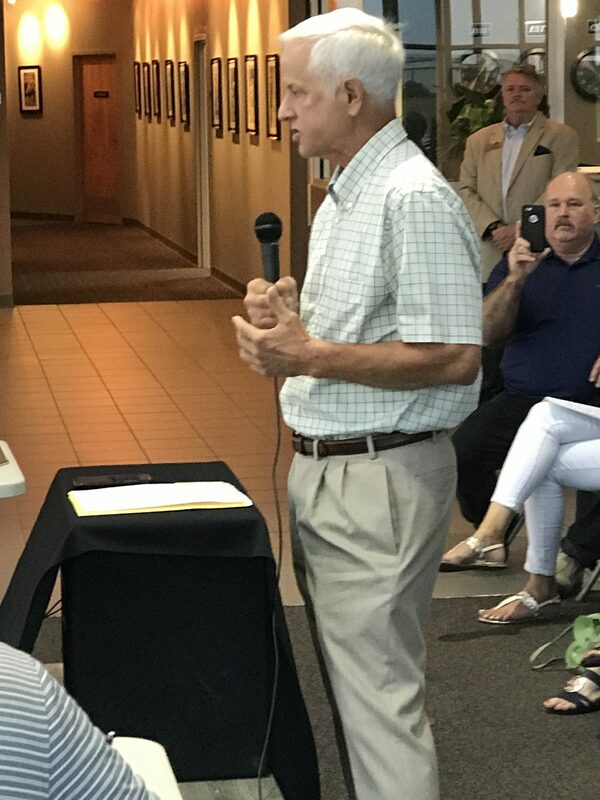 Airport Authority members usually do not comment on issue brought as a public comment, but member Allen Morrison said he did want to address the issue. “I agree with what you’re saying. I think we should have workshops. If we present something to the FAA that is reasonable they would accept it,” Morrison said to a crowd that applauded his comments. An amazing job of capturing the spirit and core complaints of the many, many tenants who have supported this airport through the years during both good and BAD times. Hats off to the Citizen for its concise, informative and very accurate reporting of a problem that has been long in the making for many dedicated aviators, leasors and hangar owners who use and support Falcon Field!